You're young, you're healthy, you have your whole life ahead of you. That is the perception that most of us have. We also spend $100 a month on life insurance (just in case.) The truth is that none of us know when our life will be over. Statistically however, it has been proven that every one of us has a 100% chance of dying. According to the CIA World Fact Book, on average approximately 155,000 people die every day. How many of the 155,000 that died today knew that this was to be their last day on earth? Let me ask you a question. If you were to die today, right now, do you know for sure that you would go to heaven? Maybe you are banking on the fact that you are generally a pretty good person. You feel you are "good enough" and God should let you in based on your goodness. If this is what you believe, then I highly recommend that you take the good person test to find out how good you are. The truth is that not a single one of us are good enough to enter God's heaven. We all fall far short of God's moral standard (Rom 3:23). All of us have a "conscience" (Rom 2:15) - the inherant ability to know right from wrong. 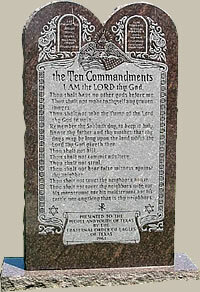 God has given us the ten commandments which is the root of our legal system. Yet who among us can say that they have never told a lie? A small white lie? Never? All of us have. What do we call someone who tells a lie? - a liar (and a breaker of the 9th commandment). Have you ever taken anything that didn't belong to you? Even something small? It really doesn't matter how big or small it was, taking something that doesn't belong to you goes against God's perfect standard and makes you a what? - a thief (breaking the 8th commandment). Jesus said that if we look at someone and lust over them then we have already committed adultery with them in our heart. Have you ever looked at someone with lust? Ever? All of us have, and according to Jesus that makes us an adulterer at heart (breaking the 7th commandment). When we line ourselves up using God's standard, we are not as good as we hoped. We have only looked at three of the ten commandments and so far we are (at the very least) a lying thief and an adulterer at heart. 1. Do not worship other gods. 3. Do not misuse God's name. 4. Keep the Sabbath holy. 5. Honor your father & mother. When you stand before God on judgment day, if God were to judge you based on the ten commandments, would you be innocent or guilty?